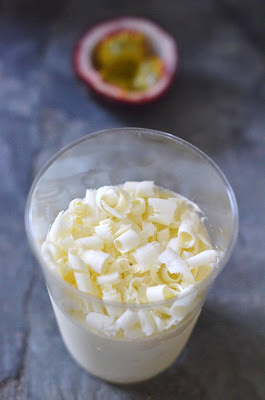 Super excited to share my Frozen Passion Fruit Mousse with White Chocolate Shavings appearing in The Washington Post, All we Can Eat today, titled 'Mousse call for Passover'. I hope to soon write about the whirlwind, a comedy of sorts, that I go through even when it comes to one single recipe. Read what inspired this delicious, simple yet elegant dessert and get the recipe here to brighten up your holidays. Enjoy the additional photos not appearing in The Washington Post. Scroll down..one little acknowledgment and announcement below. I wish to acknowledge a friend who's macs are executed with intricate precision, Annapet of The Daily Palette. She now is dabbling in sugar craft, you would never guess she is a beginner, just look at her twitter avatar. Annapet started experimenting with Italian meringue for macs just shortly before I did so I was picking her brain, on dm, while I started playing with Italian meringue over the winter months, for krembo and this frozen Passion Fruit Mousse dessert. Lastly, I will be teaching a number of Indian Cooking classes at the state of the art Living Social at 918 F St. facilities. The classes were announced today. I hope to meet, in real life, many familiar faces from the DC metro area and it is a short trip, for a fun outing in DC, whether you are in Baltimore, Richmond or Philadelphia. Click here to sign up! Wonderful! I love passion fruit and white chocolate together! I bet your classes will be fabulous; hope you have a stellar turnout. TY So much Jenni. I think recently but you got to double check with Annapet! This dessert is beyond gorgeous, Shulie! How exciting that you'll be teaching those classes - you're going to be great! I wish I lived closer so I could be a student. TY Dara! You've been a good friend. I wish you were closer too! That is a delightful dessert! The flavors are out of this world. A terrific combination. TY Alison. That would have been incredible and for sure our paths will cross soon I hope. Wow, congratulations, Shulie!!! You're a star!!!! And I can see why...this mousse looks amazing! Congratulations Shulie, such exciting news for you! TY Jeanette!! I've been antsy all day. I have to tell you, I just adore passionfruit! Thank you Shulie for sharing this. I know, me too! & my pleasure. In Israel they serve them as layered mousse. So good!! Such exiting news! Love it and congrats! 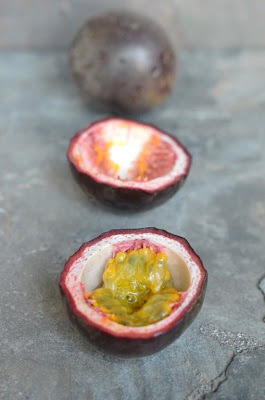 Passion fruit is one of my favorite fruit and this looks amazing! Oh Nelly TY so much. I bet in the DR it's way cheaper than here. Love the tang! TY Chimnayie. We've got 1 left. I made two or three batches of this dessert. so exciting Shulie. Congrats again. Keep us posted about it. And this mousse? its looks marvelous! TY Kulsum. How sweet of you. Yes certainly. Wow, this looks incredible and I love your photos. Such exciting news too and congratulatons with the Washington Post. I would definitely want to attend your class, only problem is I live In Florida. Hope you have a wonderful weekend. What a pairing! I have love/hate relationship with white chocolate. Sometimes I love it, sometimes I don't. I do tend to love it when paired with fruit, so I have no doubt this would be up my alley. Congrats on the wonderful achievement Shulie! Thx Bri very gracious of you. You know what?! Believe it or not, me too, but it was the first flavor combination that came into my mind. 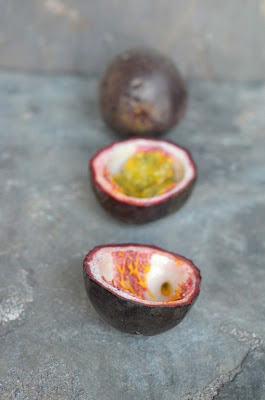 My heart was set on passion fruit and I couldn't shake my gut feeling that this pairing would be incredible & it was. Lastly, I really want to sign up for those classes. Lol. Heehee can you imagine if you expressed yourself from India to surprise me in my class?! I would just be beside myself! In any event An TY sweet girl. Well..... I don't consider it chocolate.... but I do love it! And with passion fruit - WOW! I can taste it and it's wonderful! :) I was waiting for this comment. I don't have strong feeling about it either way but I completely get what you say. :) I know, right?! The sensation jumps out of the pages. I wonder if last one is gone by now?! This is an unusual Passover dish and I think, it is fabulous. You are good. Today, I don't want to cook but this is something, I would like to make, later in the week. I would do it with the mangoes, I have, just waiting to be used. 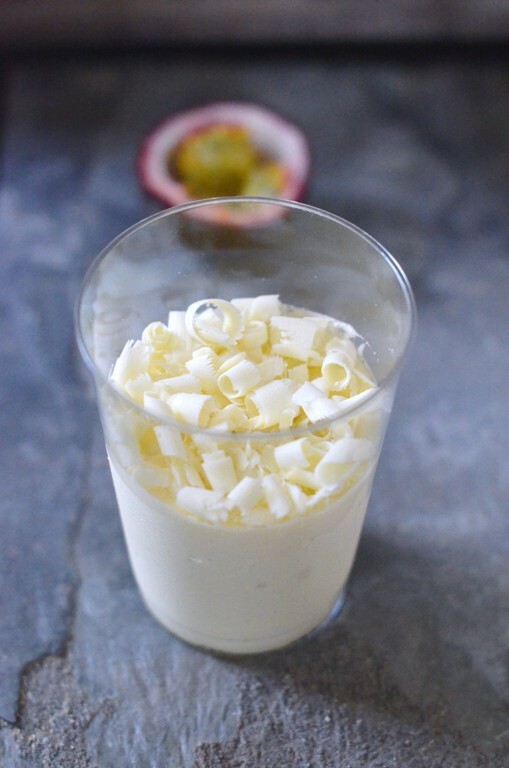 The hubby loves white chocolate and I would love to make this for him. Congrats on the fabulous achievement sweetie :) Wish I could come and attend the class too! Shulie, congrats on the Washington Post feature and also on the cooking classes! Just one of the two is exciting enough but both together is beyond awesome! Love the flavors going on in this mousse--I was never fond of white chocolate but I have been really enjoying it the last couple of years. This is a winner! Thank you so much Jaime! Happy Passover to you too. Can't wait to hear about your happenings at IACP. Heehee TY girlie!! Appreciate the friendship and support! & aww would be brimming with happiness to have you in my class!! this looks so good! I would not have thought to combine those flavors but I cant' wait to try! White chocolate and passion fruit is a match made in heaven. Congrats on the cooking class! Absolutely. Quite a pair! :) Thx Sylvie! Oh you have so much positive news! Congrats Shullie! I was thinking of a falvour for my chocolate mousse cake! This will be IT! Ooh...TY& congratulations!! Share some pics when you get a chance. 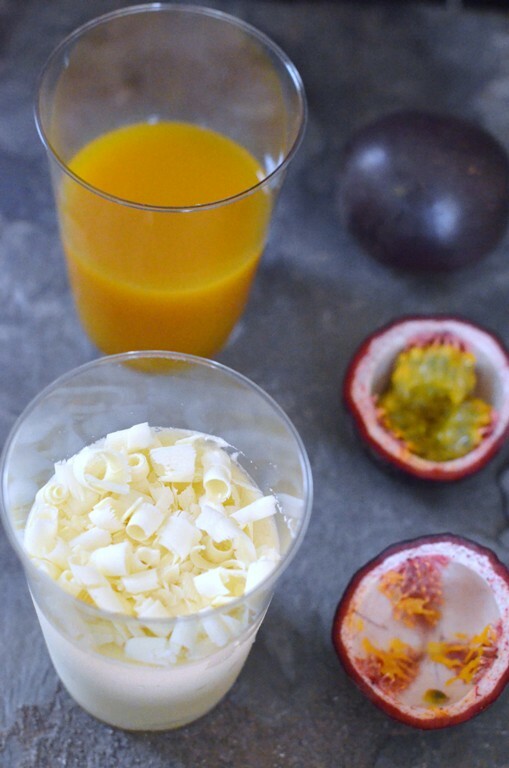 Passion Fruit and White Chocolate is a match made in culinary heaven! And knowing you, this dessert is not overly sweet! 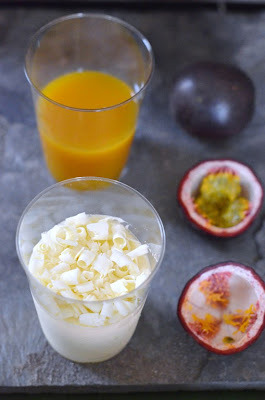 Truly, passion fruit and white chocolate are on my short list of dessert favorites! Thank you for the kind mention, Shulie! You just inspired another macaron flavor! Giddy to see what you come up with Annapet. Can't wait! Thank you my friend for all of the support from early on. Photography, writings, cooking classes..you are one big busy mom, Shulie! The dessert looks heavenly. Ahahaha Sanjeeta, dear friend! My kid is out of the house so it's a tad easier, if only I were more organized! TY! 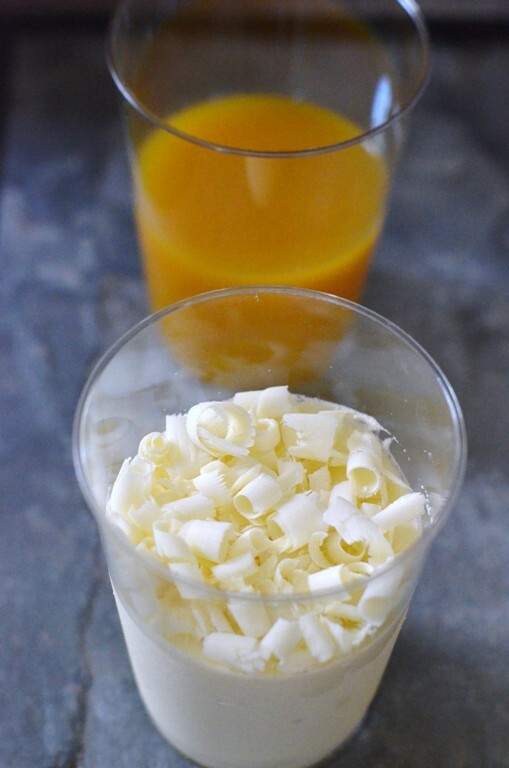 The bitter sweet of Passion Fruit will surely melt on those white chocolate shavings! Love it! Tangy! :) TY & hello! A lovely pairing of two of my favorite flavors. Good luck with your upcoming cooking classes. TY Sarah. Indeed. One fruit I absolutely love white chocolate with. TY Emily! Sometimes the photos come out well sometimes I struggle. This is beautiful and I'm so excited to hear that it was featured in the Washington Post. You are so talented, and I'm not surprised. Your photographs are just stunning. Thank you for sharing...and inspiring me! I just saw this recipe on the Washington Post and it really looks yummy, but I do have two questions, So the sugar syrup remains thin it doesn't have to thicken or change color and instead of the ramekins/cups can it be served in a single bowl or it wont settle? HI Vivian, I've emailed you back but to answer your questions: Yes, just melt the sugar into thin clear liquid and this is best portioned into individual cups as instructed in the recipe. I hope this helps.